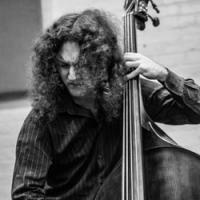 Tune in to the Musician's Show this Wednesday, April 12, from 6:00-9:00 PM EST for a live interview with bassist, composer, and bandleader Max Johnson. Known for his big sound, eclectic style and prolific output, Johnson has made a name in both the jazz and improvised music world, playing with musical icons including Anthony Braxton, John Zorn, Muhal Richard Abrams, among others, in addition to becoming a first call bluegrass bassist, playing with legends Sam Bush, David Grisman, the Traveling McCourys & Tony Trischka. Johnson has performed throughout North America and Europe, including at top festivals and performing arts centers such as Lincoln Center, the United Nations, Lollapalooza, Quebec City Festival, and the Bern Jazz Festival. Johnson has been featured as a sideman on over twenty-five recordings, including the platinum-selling Night Castle by Trans-Siberian Orchestra. An active bandleader, Max Johnson has six records to his name: Elevated Vegetation (FMR), The Invisible Trio & Something Familiar (Fresh Sound-New Talent), featuring Kirk Knuffke on cornet & Ziv Ravitz on drums; The Prisoner (NoBusiness) featuring Ingrid Laubrock, Mat Maneri & Tomas Fujiwara; and Quartet (NotTwo), with Mark Whitecage on alto saxophone and clarinet, Steve Swell on trombone, and Tyshawn Sorey on drums. Big Eyed Rabbit, his collaborative trio with Ross Martin and Jeff Davis, also released their debut album in 2014, Big Eyed Rabbit (NotTwo).